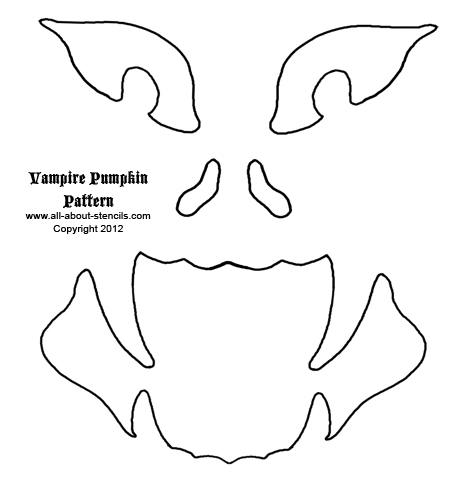 Use these free pumpkin patterns for a face only a ghoul could love! After all, carving a Jack O Lantern is tradition but it doesn’t have to be the same old toothy grin. I love Halloween because of the great traditions and the fun decorations. OK! It’s really the candy. No, no! It’s the fun decorations. 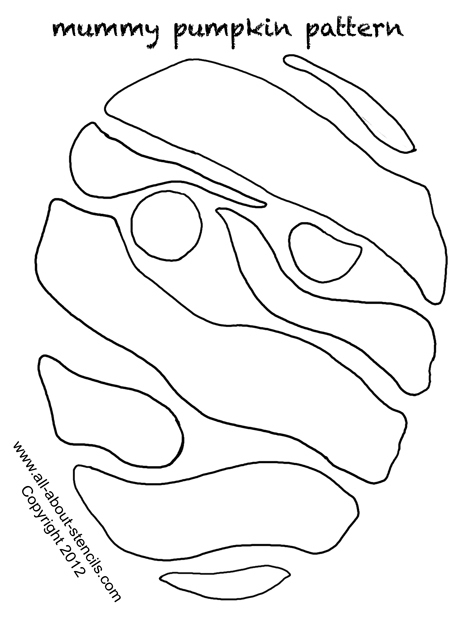 Anyway, these free pumpkin patterns fall into the fun decorations category. With a pumpkin carving stencil you’ll need to have a little imagination because you will end up seeing the light come from the openings and all else will be dark. Picture this vampire streaming light from a flickering candle from behind those sharp teeth. How ghoulish! There are many other ways to use these stencils besides carving pumpkins. You could cut the design into a paper bag and put a little battery operated tea light candle on the inside for an eery glow. Or you know what else would be spooky. Why not throw in one of those green glow sticks? It would be safe and that pukish green glow would definitely be scary. Mummy’s are a big part of Halloween. I mean, what’s scarier than a 3,000 year old dead guy wrapped in dusty old cloth? And what’s under there anyway? Eeeeewwww! Can you picture him glowing through his wrappings and eyeballs? You know you could paint these designs on a plain canvas tote bag to make a narley Trick-or-treat bag. Just use it like a stencil and cut out the openings and with a brush or sponge, push some paint onto the bag. If you need more ideas about stenciling, then just take a look around here. Also, if you want more Halloween Crafts, look no further. Check out the column on the right for all the other free Halloween stencils we have and usually there are many other craft ideas to go along with each one. So, go and have a ghoulishly good time! Hey! Don’t forget that I (and everyone else) want to see what you have done with your pumpkin stencils. Just click on Stenciling Projects to get your masterpiece showcased here on this web site. Won’t that be exciting! Or if you have any questions or want to share information join in on the Stencil Blog. Well, I hope to hear from you soon.